The Dark Knight is one of the greatest superheroes of all time and it’s clear when we look at his story catalog filled with an acclaimed book after another. I decided to tackle my favorite Batman story ! When I did more research a familiar question popped up. 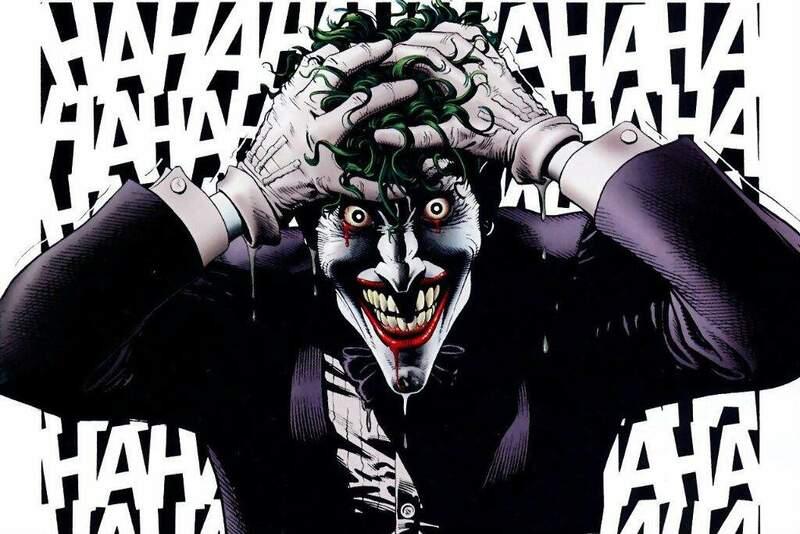 Did the Joker die at the end of the graphic novel? Well, may I warn you this post is filled with spoilers from the comic and if you haven’t read please, don’t be a fool and go read it. Now, that we got that part out of the way we can answer the main question. 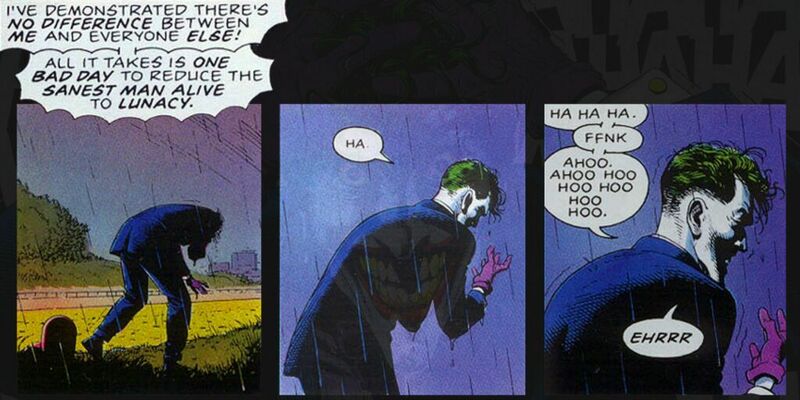 As anyone would remember the Killing Joke ends with the Joker telling Batman a joke. The clown laughs….a beat later so does the bat. 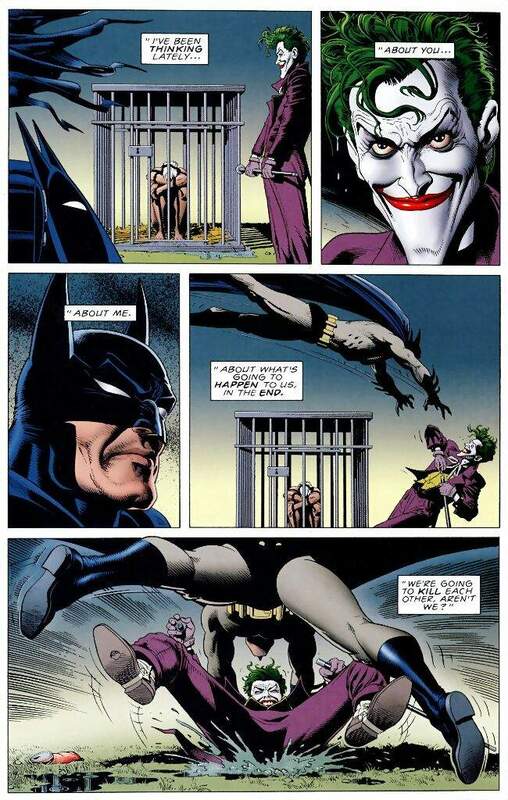 Batman reaches out to the Joker as they share the moment, the shot pans out and laughs end. 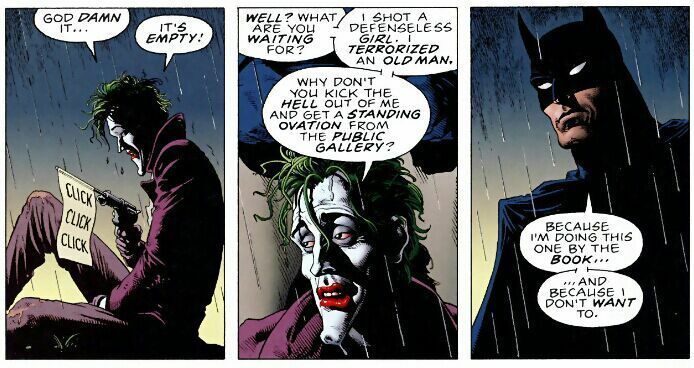 To many this wouldn’t only mark the death of the Joker, but also a breach of Batman’s #1 rule: I shall not kill. Yet many seem to believe Batman did not kill the Joker, therefore he lives. For the longest time I was part of the pro-kill theory. 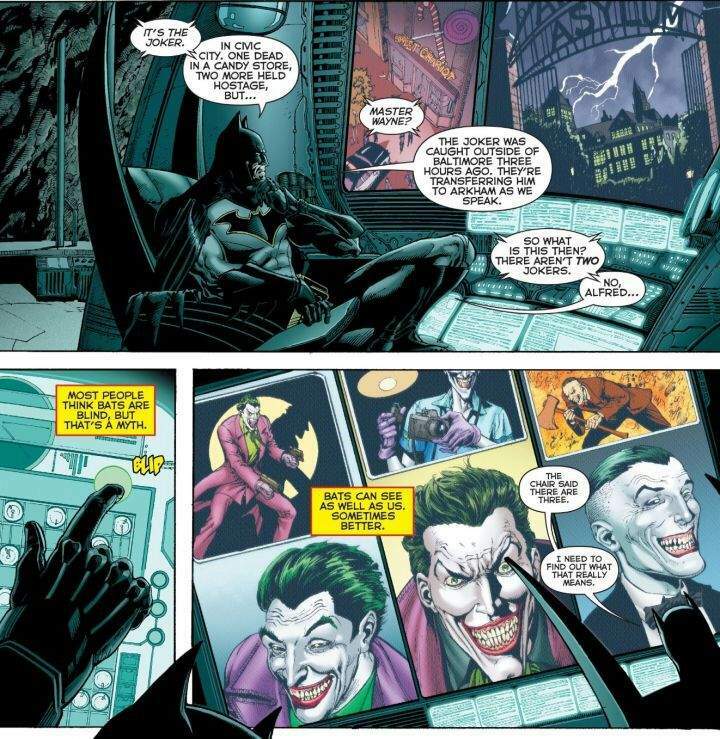 Since DC Universe Rebirth #1 revealed to us there exist 3 different Jokers and only 2 were mentioned within the issue itself it became super clear to me that indeed Batman killed a Joker. But then I looked at the story with a different sort of perspective. One day Alan Moore decided he wanted to cripple Barbara. The Joker was constantly trying to prove that he was right! He was trying to break Commissioner Gordon’s spirit. And guess what….he was wrong. The Joker brutally shot Barbara Gordon, took off her clothes, took pictures of him and tortured her father by imprisoning him and showing him the images. The biggest nightmare of a father is to see their child feel helpless. 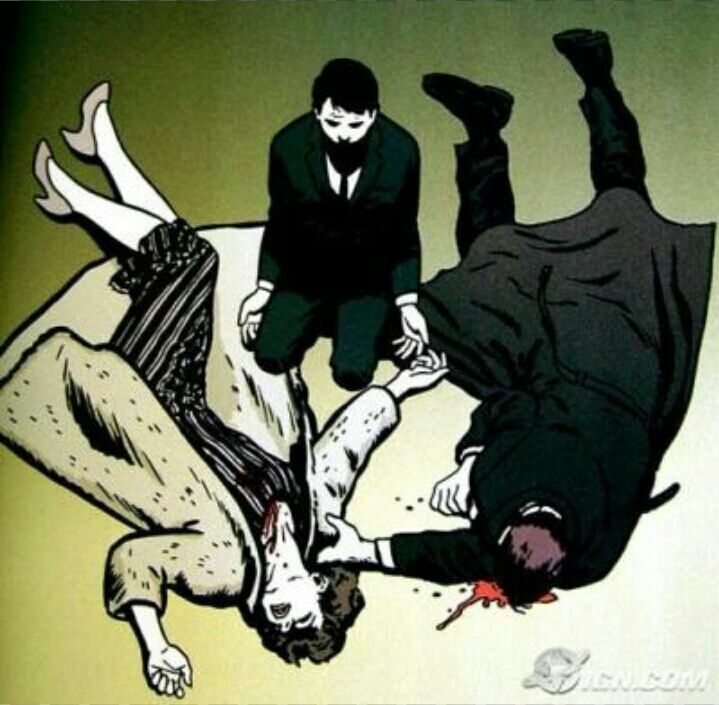 Jim failed his most important duty……..but that didn’t break Jim Gordon. In fact, it only made him stronger, which I have to give him props for. I wouldn’t imagine seeing my daughter in such state if, I had one. So we clearly know that Joker failed at proving his point, THE END! Well I hope you guys enjoyed this blog, I had fun looking at the entire story, well, maybe I didn’t look at the entire story, but that’s okay because, well…..if we were to look at the entire story…..what if I told you that indeed the Prince of Crime did prove his point? What if I told you that truly the Joker wasn’t trying to make James Gordon mad, instead prove something to Batman. But what was he trying to prove to him? Let’s find out. Throughout the comic there was one person who could’ve stopped it all. Not Jim nor Barbara, but Batman. It was Batman who wasn’t there when the Joker escaped, it was Batman who wasn’t there to save Barbara, it was Batman who wasn’t able to prevent Jim Gordon’s torture. 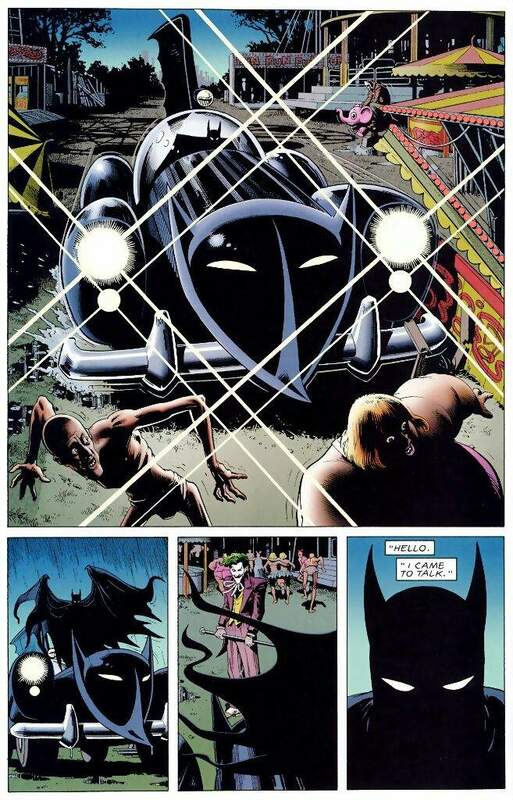 Barbara, Jim were one of the most improtant things Batman has accomplished and all of it was being taken away from him as if he was a child helpless to do anything, but watch the tragedy unfold. Sound familiar? So we got clear evidence supporting why Batman would be a clear target, but we also need the Joker’s clear motive against Batman. Well, going after his closest family is already a given. 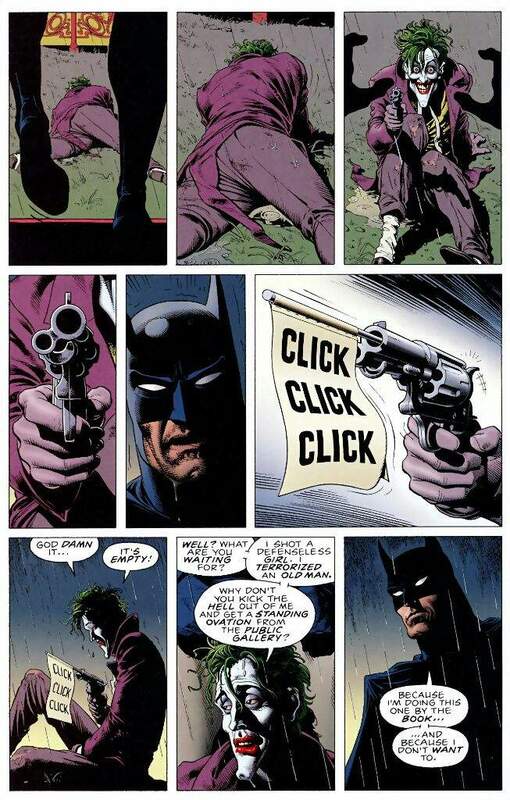 For some reason everyone seems to be forgetting this important page from the Killing Joke. Inside the Batcave when Batman struggles to find out what the Joker will do once he escaped the Asylum. The Batcave is basically a base of operations, but it also serves as a trophy museum for Bruce’s accomplishments. In that one page alone we have both the T-Rex and the giant penny which are there for a reason. They’re there to show us the successful history and among all that success we have a group photo that Bruce holds the closest to him, right on his desk as his biggest victory. Now imagine Bruce’s friends, legacy…..FAMILY! are all at risk throughout the story. So we have Joker’s plan, but now we need to answer the question, “why”? Why is he doing this? The ultimate motivation. A hero who doesn’t kill says he’ll do ‘his best’? Now, sure Batman has a history of doing things not “by the book”, but then Jims says “You hear me? We have to show that OUR way works.” Jim knows Batman never had a strong relationship with the police so, of course he isn’t telling him to act like a cop, but to be a hero. OUR way so the thing they both most value and that is justice. It’s why Jim Gordon always trusted Batman. He knew the Dark Knight was a symbol of justice and part of why he believed that was because he knew Batman was loyal to a moral code. Someone with such a moral code wouldn’t just say “I’ll do my best.” Batman has defeated the Joker on multiple occasions, why would this be any harder that would force him to say this? In the final confrontation Joker believes he broke Jim Gordon, but for some reason when he hears the news that the commissioner was unaffected he was in denial. He still believes he’s right, he’s convinced that he knows it! James Gordon was just supposed to be one of the examples he brought up among the many like, the one about humanity almost starting a World War III on numerous occasions. He sets traps that we all know Batman would have no problem of getting through, to slow him down so, that he can tell him what he wants Wayne to hear. Then if we skip to the “final battle”, the monologue repeats itself, but this time it cuts halfway through. It ends right at the part before Batman says he wants to talk with reason. Now combine this with the split second of Batman’s sudden stop before possible death, it seems like Batman believes it already has come to this moment. A moment when either one of them will kill the other, it’s a moment when Batman thought he was gonna die, but he didn’t. And this brings us to the last scene. 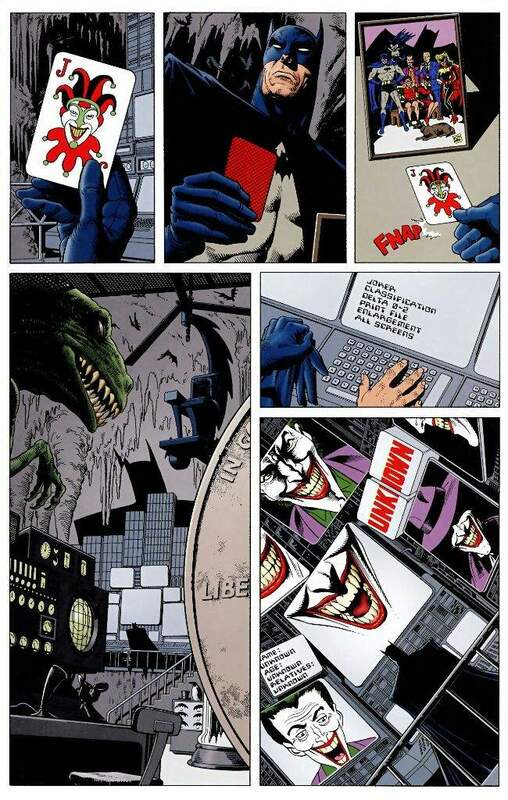 The main motive of the Joker. That is the moment when the Joker realizes he can’t make Batman understand. He set this whole thing into motion, even gave Batman a speech proving he knows someone died in Bruce’s live that made him dress up as a bat, yet it still didn’t work. He then tries to kill the Batman. 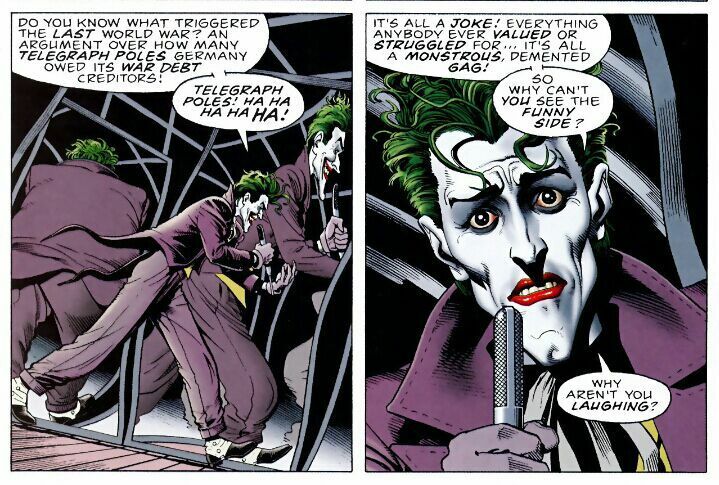 Joker tries to stab him. Even when he tries to shoot him he sounds dissapointed that the gun wasn’t fully loaded. What follows is Joker’s realization that all of this was indeed for nothing, that Batman can’t understand anything. He wants Batman to end his life. 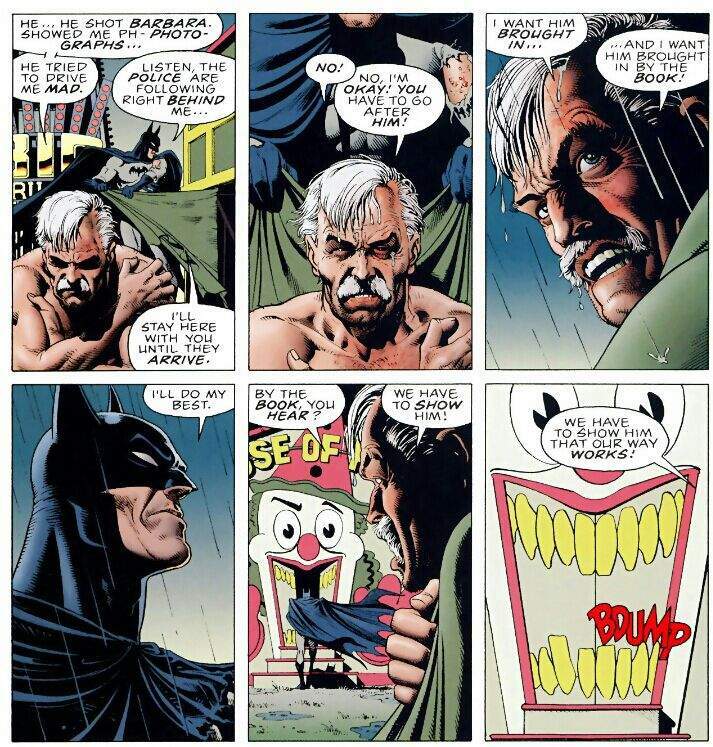 The Caped Crusader says he wants to help the Joker, and the Prince of Crime remembers a joke. Batman listens to it, how he will never be able to help him. No matter how hard Batman tries he won’t be able to help the Joker, because inside Batman doesn’t really want to. And that’s when Batman realizes the Joker is telling the truth. What Batman deep inside knows is he will never rehabilite the Joker because in that same deep inside he himself is crazy (in the joke both friends are from the same asylum). This whole time he’s been saying he wants to prevent the death, but that’s impossible. What he truly feels inside is a desire to kill him, to turn off the flashlight halfway through so that he falls. 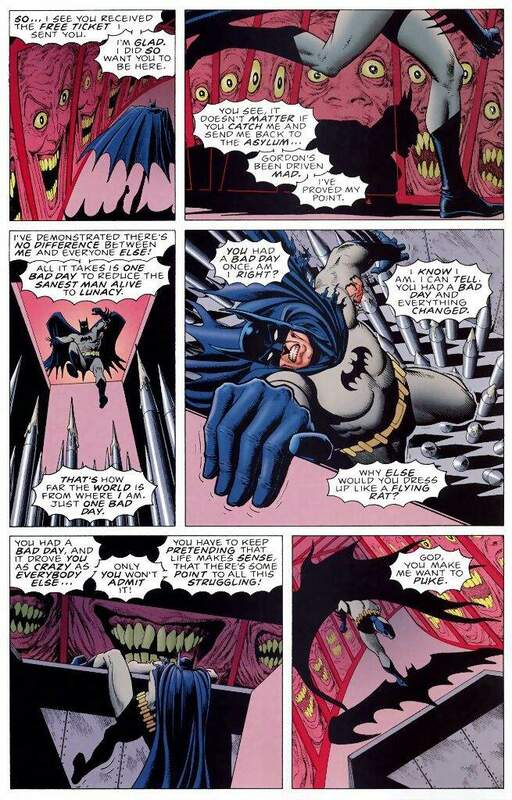 This desire to kill is what really makes Batman crazy, he tries not to kill because he’s scared he will reveal his true crazy colors. Just as the Joker did throughout the story, a confirmation comes out of Batman’s mouth. He laughs. 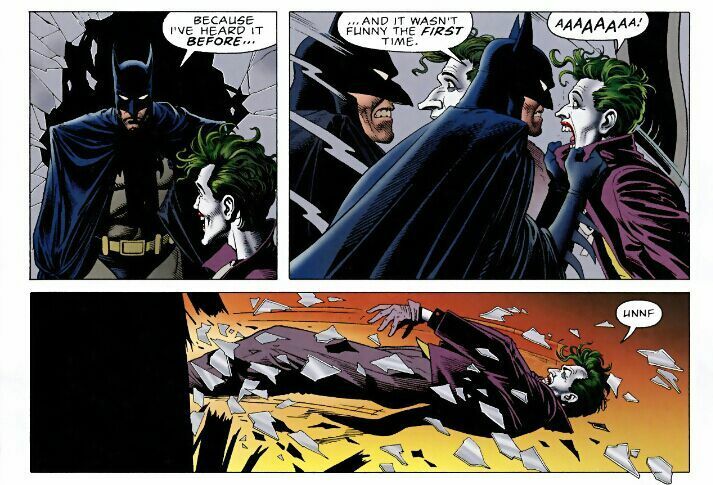 This is when Batman reaches out to rest himself on the Joker, to laugh it off and…..Batman kills the Joker. He’s crazy. Even though he died the Joker won. He did that by showing Batman his true nature. It seems like it were words that in the end change the Dark Knight and not the action. It was the joke. So I hope you enjoyed my unraveling on the real meaning behind Batman: The Killing Joke and what the ending truly meant. I mixed this week’s challange with a comic theory, which I hope paid off. It was truly difficult to put the final description into words being Alan Moore’s and Brian Bolland’s work was so complex. Previous #SJWCramSpam: Thordis & Mrs Marvel – Shallowness Over Meaning?